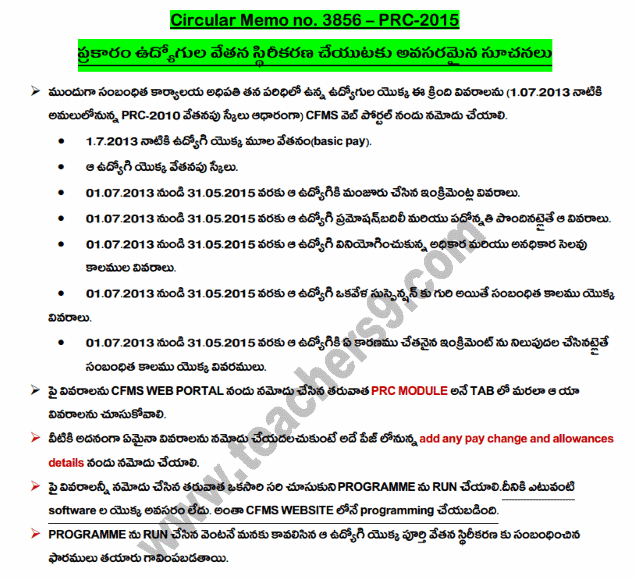 A.P government has released circular memo no.3856 for Procedural Instructions for fixation of pay of employees in the Revised Pay Scales, 2015(PRC-2015) and Audit of Claims.Based on circular memo no.3856, I came back with A P PRC 2015 salary FIXATION PROCEDURE IN TELUGU.If you have any question like How to make fixation of my salary in new Revised Pay Scales, 2015 or PRC-2015,you may get clarification with below AP PRC 2015 SALARY FIXATION DETAILS IN TELUGU. SALARY FIXATION PROCEDURE IN NEW PRC 2015 AND COMPLETE DETAILS . punishments of stoppage of increments with/without cumulative effect. The Heads of offices who have entered increment and promotion data for their employees shall re-access the PRC module to enter additional information relating to allowances in the new format given under tab “add any pay change and allowances details”. Difference in pay to be claimed. The Head of the office verifies the pay fixation and other particulars with reference to the entries in the Service Register and approves it after satisfying that the pay fixation is in order. The system generates the order on fixation of pay in the Revised Pay Scales, 2015 from 1.7.2013 and regulating the pay fixations from time to time thereupon. In case when Head of the Office is not competent to fix the pay or approve the fixation ,the competent authority shall approve the fixation and return to the Head of the Office for claiming the arrears. After approval of the claim, the system generates A.P. T.C. Form No. 47 duly indicating the arrears of pay fixation. The DDO concerned shall verify the arrear claims with reference to the amounts drawn by the employee.After thorough verification, shall sign the Bill and prefer the claim at the Treasury Officer/Pay and Accounts Officer, Hyderabad, after making necessary entries in the service book under proper attestation. The system also generates a statement indicating as to how much of the amounts worked out due to fixation in Revised Pay Scales,2015 are adjusted notionally,amounts calculated from 02.06.2014 to 31.03.2015 and amount paid in cash from April, 2015 which shall be communicated to the respective employees. Theclaims on account of fixation of pay in the Revised Pay Scales, 2015 shall be preferred in duplicate and presented to the District Treasury Officer / Pay and Accounts Officer, Hyderabad. The bill should be superscripted in “RED INK” as “Claim for Pay Fixation arrears in the Revised Pay Scales, 2015” to make it distinct from other bills along with service register. The Drawing Officer shall ensure that the bills are supported by proper sanction orders and schedules required in respect of the claim in duplicate indicating the details of the employees, before submitting the claims to District Treasury Officer/ Pay and Accounts Officer,Hyderabad/ as the case may be. All the Drawing Officers are directed to ensure that the bills are drawn as per the above orders under CFMS modules.The amounts payable in cash shall be credited to the respective bank accounts of the employees through CINB account maintained by treasuries. If the Audit Authorities report any erroneous pay fixation, the Drawing Officer should check again, with reference to the pay fixation already approved. If pay fixation was approved by a higher authority, the fact should be reported by the Drawing Officer to the concerned Audit Authority. Suitable action should be taken to rectify the erroneous fixation if any immediately. In case of Heads of offices/ Heads of Departments the pay fixations generated shall be submitted to the competent authorities/Heads of Departments or to the administrative departments of Secretariat concerned for approval of pay fixations. However, the procedure of drawal shall be as per the guidelines indicated above.